Odin, Thor, Loki – the Gods of the Vikings – had many wonderful adventures which have inspired the likes of Wagner. Loki, god of fire and mischief, steals Sif’s beautiful golden hair. In doing so he enrages Sif’s powerful husband, Thor. In this Norse Story, we learn how the gods of Asgard are able to stay forever young. How the chief of the Norse gods gained True Wisdom and the terrible price he paid for it. Prince Sigurd comes of age by fighting a dragon. His teacher Regin gives him a sword and sets him the task of killing the fearful reptile, Fafnir. Thor, the Norse god of Thunder, goes on a fishing trip with a giant, and rows into the waters of the Midgard Serpent. Fenris the Wolf was so strong that he could bite through chains. The tragic, tale of how a favourite son of the gods was killed. This one is really sad. Loki, the Norse god of fire and tricks, is punished for his crime. Thor the Thunder is often pictured carrying his hammer called Mjolnir, which he uses as a battle axe. 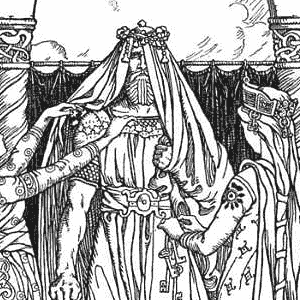 In this Norse Myth, he has to dress up as a girl.